Animal Friends is taking part in an international campaign, which is lead by the British organization VIVA (Vegetarians International Voice for Animals) against the massacre of kangaroos for their meat and skin, which is taking place with the permission of the government. 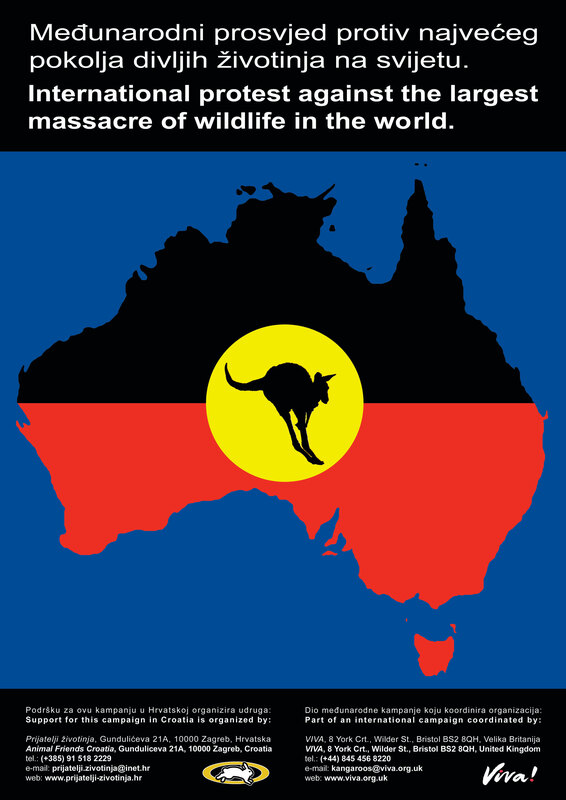 We are demanding that the Government of Australia put an end to the massacre and that they protect their indigenous species. In addition to America, Australia has the worst animal and plant species extinction record. We invite you to the protest that will be held at the corner of Gajeva and Bogoviceva ulica in Zagreb, in front of the hotel Dubrovnik, on Thursday, June 26, starting at 12 noon. 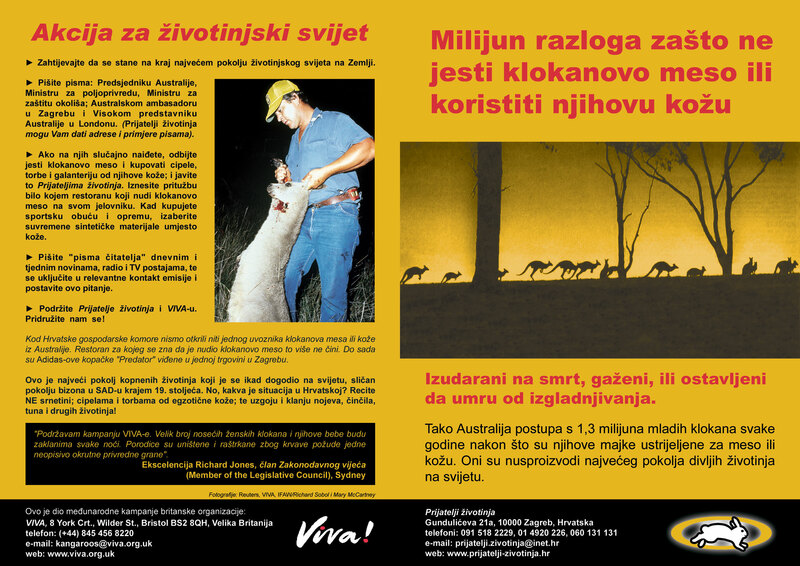 The leader of the protest will give out information there, and the protest will proceed towards the Australian Embassy, Centar Kaptol, Nova Ves 11, where we will hand a letter of protest to the Ambassador in which we request that he appeal to the Government of Australia to stop the kangaroo massacre. After that, the protesters return to the corner of Gajeva and Bogoviceva ulica. Fortunately, the only restaurant in Zagreb known to have offered kangaroo meat does not do so any more due to poor demand. Let it stay that way! The residents of Australia refuse to eat that meat, so it is sold to countries in which attitudes towards animals and nature are poor - such as China, Russia, Romania, South Africa, and even Serbia. 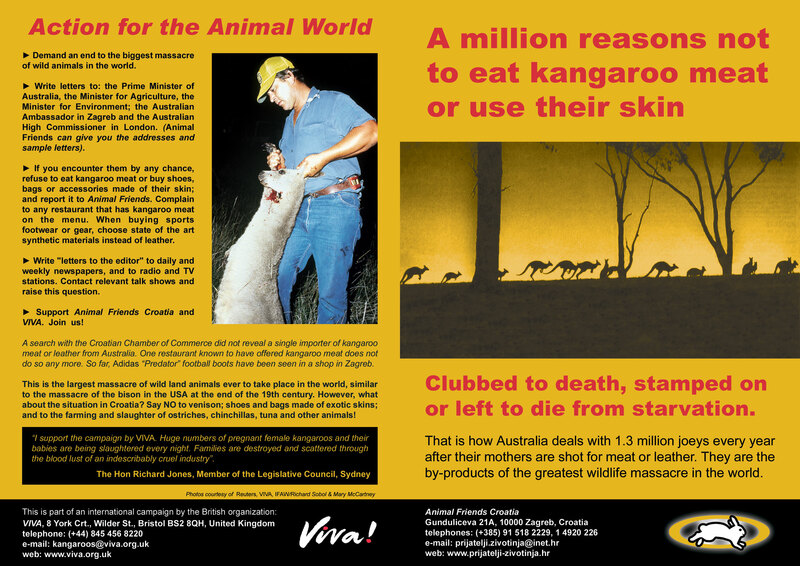 VIVA has succeeded in persuading over 1,500 supermarkets and shops to stop selling kangaroo meat. The campaign is now directed towards the use of the skin, which is even more lucrative than the trade in meat. The skin is used to make football boots. The largest market share is held by adidas, so we are especially targeting them. 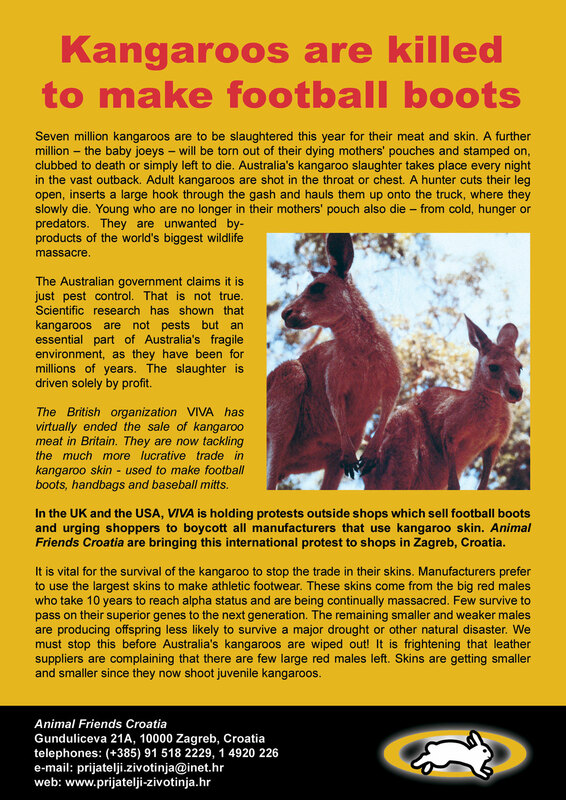 We are demanding that they stop using kangaroo skin and that they use modern synthetic materials instead. Shoppers can write letters (in German or English) and send postcards to the head office of adidas in Germany. 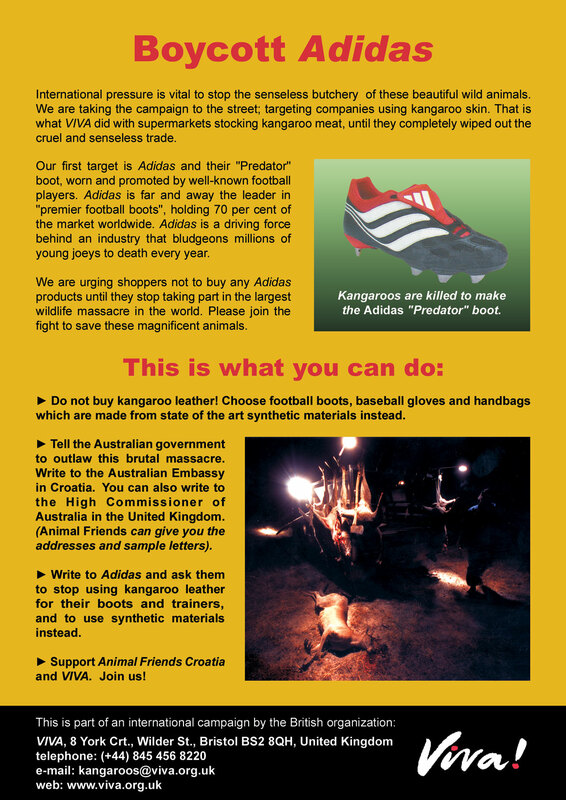 Shoppers can also boycott adidas until they stop taking part in the extermination of kangaroos. This is the largest massacre of wild animals since the massacre of the bison in America at the end of the 19th century. The official kill-quota is 6.5 million kangaroos, but that does not include non-commercial kills, road deaths, and the deaths of joeys after their mother is killed. The total death toll is over 10 million. In Australia, 6 species of kangaroos are extinct, with 4 more extinct on the mainland, and 17 species are endangered. Farmers maintain that kangaroos destroy crops and that they compete with sheep for grazing. Scientific studies have shown that kangaroos never visit 95 percent of wheat crops and that they do not influence the grazing of sheep, even in drought conditions. Kangaroo numbers are self-regulating, and have been so for millions of years. A Code of Practice exists for the shooting of kangaroos, but there are no penalties for those that do not comply with it. 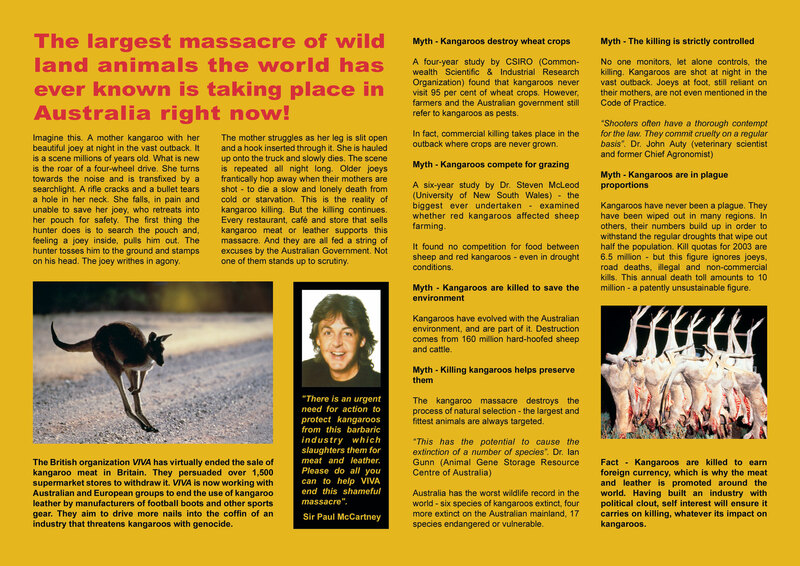 Hunters are often cruel when they kill kangaroos. This overshadows every example of killing and cruelty to wild animals in Croatia and we think that it is necessary to support this campaign. Our country should take part for several more reasons. Animal and plant species are world heritage and they do not belong to the people that settled in the land where a particular species is located. 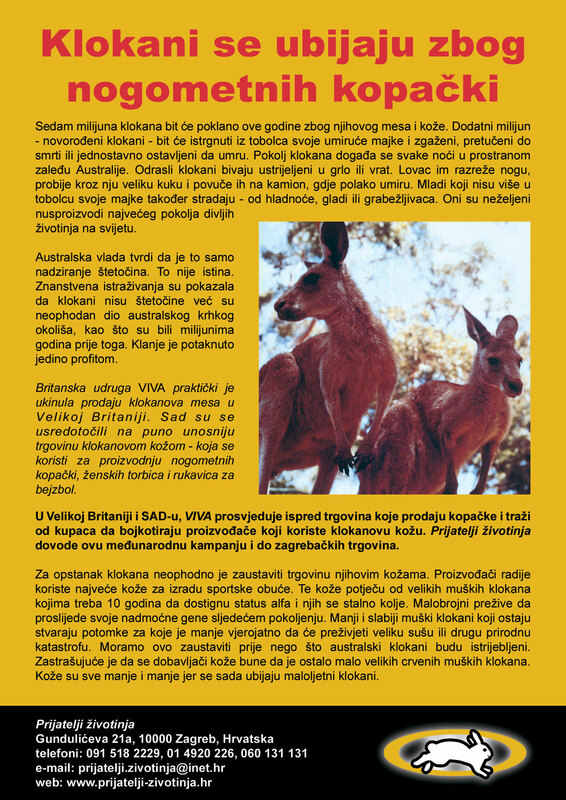 Since there is a large number of Croatians living in Australia, and the leader of our campaign is a returnee from Australia, we want Croatians to make a positive contribution towards the protection of animals, plants and nature. We do not want our country to be known for the farming of chinchillas, ostriches, tuna and other animals; and as a land in which the slaughter of roedeer, bears and wolves takes place. We do not want Croatian emigrants to be known as large-scale fishermen that plunder the seas of the world, carrying out genocide upon dolphins in the process. We should not be proud of the fact that our emigrants helped "build" their "new homelands," because that is nothing but the destruction of nature and the oppression of Indians and Aboriginals. We want to be a positive example in the protection of animals and nature, as we almost became with GMO-s. This is an opportunity to ask our residents not to support ecocide in Croatia or in any other country. Say NO to venison, tuna, hunting, snakeskin and other products made from animals. Do not buy exotic timber or furniture made from it, because it is the main reason why it is profitable to destroy rainforests. The massacre of rainforest animals is just a by-product. Similarly, say NO to exotic pets, exotic leather and fur.